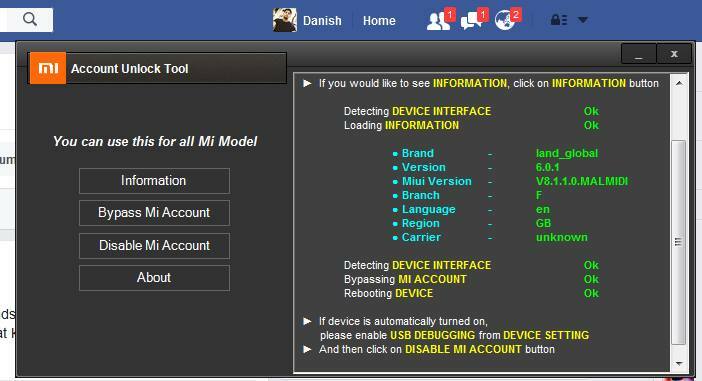 MI Account unlocker software free download for windows. MI Account unlocker software allow you to unlock your MI , REDMI, XIAOMI mobile phones and it is completely free to download and very simple to use. So if you want to unlock your MI phone using this useful utility tool then just download and install MI Account unlocker software on your windows PC and start unlocking your MI phones now. .
and then connect mobile to PC and click on deasble MI Account button. MI Android devices provide built-in security features you can use to protect your device and information, including screen locks and data encryption. Data protection, is a security feature on Mi Xiaomi Android devices. Mi Account is activated when you set up a Mi Account on your device. Once MI Acount is activated, it prevents use of a device after a factory data reset, until you log in using a Mi Account username and password previously set up on the device. How does Mi Account work? If you have a Mi Account set up on the device, Mi Account is active. This means that after the reset, you'll be required to log in to the Mi Account using the username and password. If an unauthorized person tries to reset the device by another method, the device would still require log-in using the Mi account username and password. This means that if your device is lost or stolen, another person would not be able to reset it and use it. Well, a good quality post. I think if you were to describe it in more detail we would have been easy to understand. Do you have any New Version Mi Account Remove Tool ? If there is a further post on this topic then you need to post it. I hope you understand my issue.